St. Buriana was an Irish princess who travelled to Cornwall with St. Piran during the wave of mass migration of Irish missionaries. She is associated with King Gerren of Dumnonia and is said to have cured his son of paralysis. Perhaps because of these healing powers, Gerren abducted her and her release was only agreed after St. Piran was obliged to intervene. However, Gerren insisted on seemingly impossible terms. Buriana would be released only when he was woken by a cuckoo call echoing across a snow-covered landscape. Despite the two terms being clearly incompatible, St. Piran prayed all night for their fulfillment. Miraculously, the snow fell and, in the morning, King Gerrren awoke to the sound of a cuckoo. So impressed was he, that Buriana was quickly set free. Not long afterwards however, Gerren tried to recapture Buriana and she is said to have dropped dead at the moment he succeeded. She was buried in the chapel adjoining her hermitage at St. Buryan in Cornwall, where the present parish church stands. There were originally other dedications to her at Veryan, also in Cornwall, and at Berrien and Lan-verrien in Brittany, to which she presumably made sojourns. 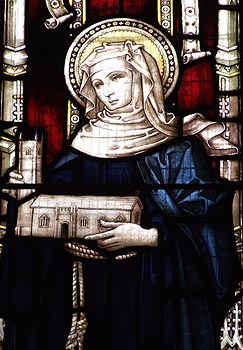 Her feast day is 1st May, but it is occasionally given as 29th May due to misidentification with St. Bruinech, a daughter of King Crimthan of Munster and foster-sister of St. Ciaran of Saighir.